FASHION DISTRICT 64 • SHOPPING CENTER BUSINESS • September 2018 O n a promising piece of real es- tate, Fashion District Philadel- phia is shaping up to be an ex- citing destination and a lynchpin for the reinvention of this part of Center City. Pennsylvania Real Estate Invest- ment Trust (PREIT) and Macerich are co-developing the 800,000-square- foot, $400 million project situated along 8th to 11th streets between Market and Filbert. "This project has been a vision of ours for a long time because we feel Philly has been under-represented from a retail per- spective," says Joseph Coradino, CEO of PREIT. "The intersection of this project coming together and the other develop- ments in Philadelphia right now is a key point to be made. There has been amazing growth in this city." In terms of Philadelphia's new devel- opment deliveries, "2018 will leave 2017 in the dust," according to research from JLL. More than 8 million square feet will deliver this year, most of which is new construction. JLL reports only about 3 million square feet of new development coming online in 2017, including about 1,700 apartments. The research says nearly 30 percent of 2018's deliveries will be office, such as Comcast Technology Center, 2400 Mar- ket, One Franklin, and 3675 Market. "If construction timelines stay on track, a remarkable 3.75 million square feet of new projects will arrive in the third quar- ter alone, distributed rather evenly across the major real estate food groups," the re- port states. Fashion District Philadelphia will join the fray in 2019. The project is being built on the site of the former Gallery Mall, which opened in 1977 anchored by Gim- bels and Strawbridge's. PREIT has been slowly acquiring the site, buying Gallery I, the first piece of the property, in 2003 and the final parcel in 2013. In 2015, PREIT and Macerich an- nounced their plans for the site. As it has taken shape, the project's character has evolved from an outlet concept called Fashion Outlets of Philadelphia to be- come a blend of full price, off-price and branded outlet retail, destination dining, entertainment, public art and cultural events. To foster civic engagement, the devel- opers are investing $1 million in commis- sioned art installations throughout the property as well as making a $100,000 phil- anthropic commitment and a three-year collaboration with Philadelphia-based nonprofit programs and Uniquely Philly, a curated collection of authentically Phila- delphia offerings creating opportunity for local businesses to establish a presence and capitalize on Fashion District Phila- delphia's foot traffic. 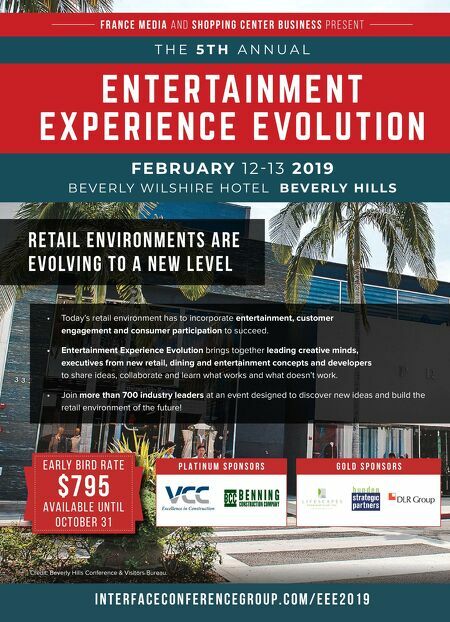 Tenants were announced in August that support the project's operating platform described as "style, dining, entertainment, and arts and culture." To drive that plan, City Winery will join Fashion District Phil- adelphia for the grand opening in Septem- ber 2019. This will be the 7th City Winery location in the United States. The venue is renowned for putting a one-of-a-kind spin on the concert expe- rience, pairing intimate performances, typically rock, soul, folk and blues, with dining and wine made onsite. City Win- ery also offers classes and hosts private events. AMC Theatres will also be joining the tenant mix, bringing an eight-screen multiplex and filling a cinema void in the city. A New District In Center City PREIT and Macerich are developing a transit-oriented destination that will enliven the Market Street area of Philadelphia with fashion, dining and entertainment. 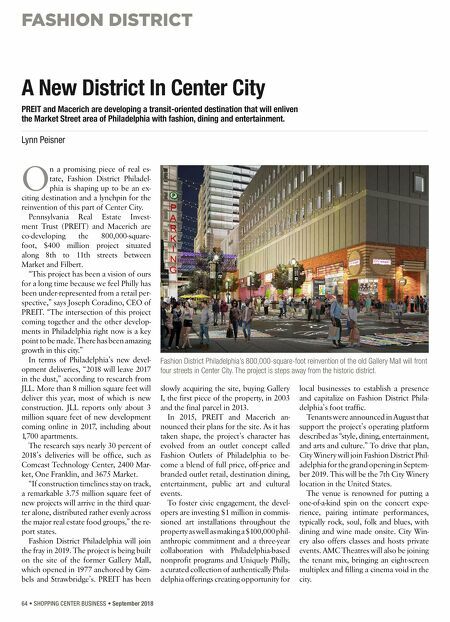 Lynn Peisner Fashion District Philadelphia's 800,000-square-foot reinvention of the old Gallery Mall will front four streets in Center City. The project is steps away from the historic district.